Shown with her very handsome, colorful son March 1, 2017 black/white bull calf CER Saint Dublin (CER RJ Admiral Rattler x High Fires Tempo). 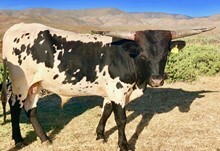 “This white and black, lighter bodied cow is a granddaughter of Tempter and 90” Zhi-Spicy Pony, the best Capone daughter and one of the best cows in the breed." Thank you to the Ohlendorf’s! We were delighted on May 4, 2018 to welcome wildly colored, inquisitive and friendly black/white heifer calf CER Cute As A Button (CER RJ Admiral Rattler x High Fires Tempo). Button’s genetics will no doubt one day add greatly to the pedigrees of our well bred herd of Texas Longhorns.